Posted by rogerhollander in Housing/Homelessness, Religion, Toronto. Ontario sculptor struggled to find a home for his haunting sculpture of Jesus sleeping on a bench. 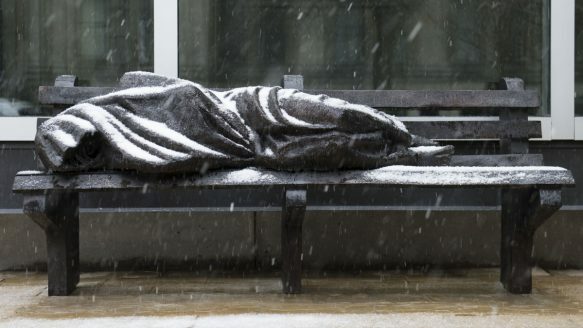 Sculptor Timothy Schmalz has created a bronze sculpture called Jesus the Homeless outside Regis College, the Jesuit college at U of T.
Jesus has been depicted in art as triumphant, gentle or suffering. Now, in a controversial new sculpture in downtown Toronto, he is shown as homeless — an outcast sleeping on a bench. It takes a moment to see that the slight figure shrouded by a blanket, hauntingly similar to the real homeless who lie on grates and in doorways, is Jesus. It’s the gaping wounds in the feet that reveal the subject, whose face is draped and barely visible, as Jesus the Homeless. Despite message of the sculpture — Jesus identifying with the poorest among us — it was rejected by two prominent Catholic churches, St. Michael’s Cathedral in Toronto and St. Patrick’s Cathedral in New York. Rectors of both cathedrals were enthusiastic about the bronze piece and showed Schmalz possible locations, but higher-ups in the New York and Toronto archdiocese turned it down, he says. Now the sculpture stands near Wellesley St. W., outside Regis College at the University of Toronto. It’s a Jesuit school of theology, where priests and lay people are trained, with an emphasis on social justice. “I’m so used to seeing images of Jesus that are palatable,” says Reynolds. But recent depictions of Jesus in political and social contexts have spurred controversy. At Emmanuel College, the educational arm of the United Church where Reynolds teaches, there is a graceful sculpture showing Jesus’ suffering in a crucified woman. Schmaltz says he intended that his Jesus the Homeless can be interpreted as either male or female. At Regis College, there is a small crucifix of Jesus as a landmine victim, missing a leg; another at the college shows Jesus as an Aztec. A sculpture in a church in Uckfield, England, shows a euphoric Jesus wearing jeans and a collared shirt. In 2011, British sculptor David Mach, created an agonized, shouting Jesus out of 3,000 straightened coat hangers that emerge like barbs from the body. Jesus the Homeless is provocative, says Reynolds, because it ‘punctures the illusion of normalcy. He now lives with his wife and family in St. Jacobs, Ont. When he returns to Toronto, he sees the city differently. Not all embrace this interpretation, as Bryan Stallings and his wife Amy discovered. They run a mission in Branson, Mo., called Jesus Was Homeless, where they serve about 1,000 people a week, many of whom live in the woods and extended-stay motels. They’ve been criticized for the mission’s name. What a wonderous statement and piece of art. fabulous.